For more than 100 years 4 generations of company’s founder’s family were cooperating to supply the industry with the highest quality products such as shears, shear cases, thinners, clips, combs, razors and blades, clippers and nippers, as well as beauty accessories. In early 1940 Harry Gromberg, the founder of company, created registered trademark which symbolizes years of experience which he and his uncle had in the industry. Company is still working to offer the highest quality products and the best service for representatives of beauty industry – barbers, groomers and cosmetologists. 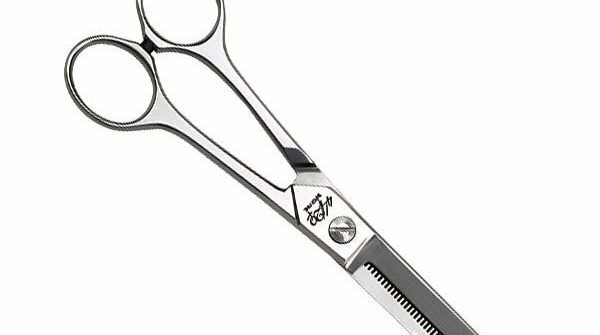 These 44/20 Taper-fine Thinning and Blending Shears are intended for hair thinning, texturizing and blending, therefore, they are equipped with two kinds of blades – one blade has 46 micro-teeth, but other blade has beveled edge. As they are made of carbon steel, they are incredibly durable and thus long-lasting. These hair thinning scissors are 7.5 inches long and their weight is 4.8 ounces. Unfortunately, they do not have any tension adjustment system, as well as rubber finger inserts and storage case, but they have non-removable finger rest which helps to relieve the stress from most affected body parts during hair cutting – hands and shoulders, preventing discomfort and development of occupational diseases. This 44/20 product is special with fact that each of their teeth is slotted and hand-notched under a microscope and they are specially tested to provide precise and smooth cutting before they leave the factory. As their 46 micro-teeth are taper-fine and razor-sharp, they hide cut lines and do not pull, bind or fold the hair. Considering that blending shears have higher number of teeth per inch, cutting surface is smaller and less hair is removed with one cutting motion, therefore, they can be used to soften hair cutting lines and to thin the hair bulk. This 44/20 product is guaranteed against defects in material and workmanship, but the guarantee does not cover damages which result from accidents or misuse, as well as in cases when shears have been tempered or resharpened. These 44/20 Taper-fine Thinning and Blending Shears have classic and simple design without any special design elements. As they are made of carbon steel they are silver color with slight polish for nice sheen. These 44/20 hair scissors are intended for hair thinning, texturizing and blending to hide hair cutting lines and thin the hair bulk. 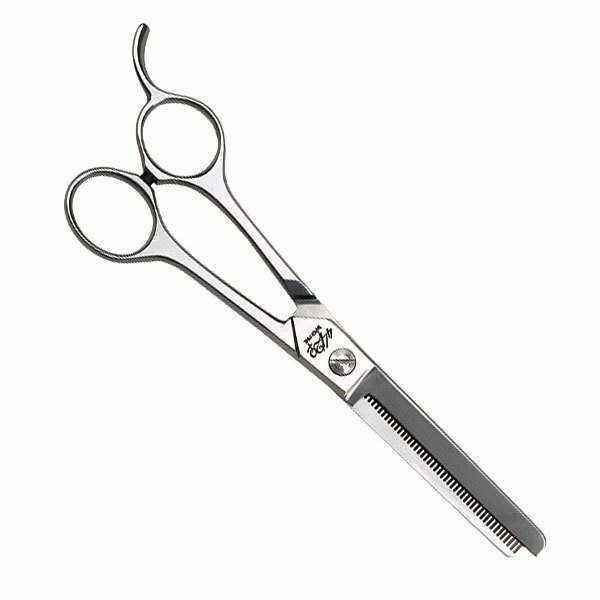 As these shears are specially made and tested for excellent performance they are suitable for professional use, namely, they can be used by professional barbers in barbershops and salons. These 44/20 Taper-fine Thinning and Blending Shears are made of pure carbon steel and they have two kind of blades – micro-teeth and beveled edge blades. They are 7.5 inches long and 4.8 ounces lightweight. This product has classic and simple design without any special design elements. They do not have tension adjustment possibilities, rubber finger inserts for size adjustment and comfort, as well as storage case, but they have non-removable finger rest for superior comfort and ergonomics. As each of their teeth is slotted and hand-notched under a microscope, as well as they are tested before they leave the factory, they have excellent quality to perfectly thin, texture or blend the hair. This 44/20 product is more suitable for hairdressing professionals. It should be mentioned, that these hair shears also have lifetime warranty against defects in material or workmanship which indicates the quality.